What can you learn from creating a skateboard? Most hands-on creative experiences provide a type of learning specifically distinct from basic abstractions or book-derived types of activity. 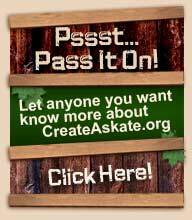 In fact, the CreateAskate.org program provides students, and instructors, the opportunity to apply abstract concepts to a real-life object that most adolescents find to be very relevant to their lives. Some of the scientific information presented in the CreateAskate.org program includes: Photosynthesis, botanical classifications, forestation, organic matter, cellular composition (expansion and contraction), geography, ecology, bio-zones, environmental studies, and recycling applications. Program also includes a link to www.americanforests.org. Mathematics is a key ingredient in the CreateAskate.org program, and includes: Weights and measurement (exactness), operations with fractions, operations with decimals, conversion, formulas, symmetry, ratios, and systems analysis. A variety of techniques and applications are available and applicable to skateboard graphic designs. Paints, inks, dyes, transfers and other options are a few of the seemingly endless possibilities for each student to personalize their own CreateAskate.org skateboard deck. Skateboarding is a healthy activity promoting an active lifestyle. Real life skateboarding, as opposed to the video game type of ‘activity,’ can exercise all the major muscle groupsthink of skateboarding as aerobic conditioning in an adolescent-acceptable format. Tony Hawk has been recruited to serve on the State of California’s Physical Fitness board. With more than 12 million skateboarders in the United States skateboarding ranks in the top three of ‘active sports’ for participant numbers. However, despite the perception that skateboarding is ‘dangerous,’ it ranks close to the bottom of the list in actual numbers being injured. Why? It’s simple, most skateboarders, approximately 85%, are recreational users, and aren’t skateboarding over the Great of Wall of China or across the Grand Canyon! Today’s complicated and highly technical modern-era skateboarding tricks are mainly limited to the professional skateboarders popularized in today’s youth culture. Additionally, legislative changes throughout the United States over the past 15 years have made it possible for many communities to develop public skateparks. The result is that today’s skateboarders typically have a safe place to skateboard while also wearing appropriate safety equipment. Many of these skateparks also provide beginning skateboarders with instructional clinics, allowing beginners to learn the basics of skateboarding under the direction of professional skateboarders or qualified counselors.